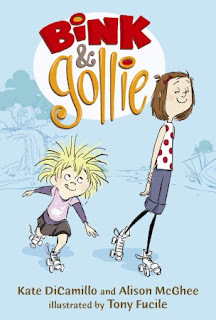 Bink & Gollie (the website is pretty fun! 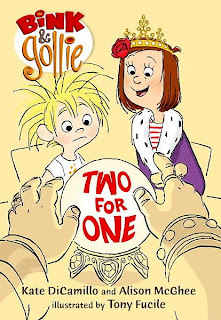 ), written by Kate DiCamillo and Alison McGhee, illustrated by multi-talented animator and author, Tony Fucile, the first in what will hopefully be a series, is out in paperback just in time for the release of Bink & Gollie: Two for One. For a passionate, thoughtful and very funny review, check out what Elizabeth Bird has to say about book one at Fuse #8/SLJ. DiCamillo (no introduction needed), McGhee (the poignant, wonderful Someday, among may others) and Tony Fucile (long time animator with Pixar and illustrator/author of the fantastic Let's Do Nothing - now in paperback!!) definitely are a winning combination and a much needed breath of fresh air in the world of beginning reader books. Bink & Gollie are have joined the ranks of a long line of fantastic, famous friends in picture books. From Frog and Toad to George and Martha, Elephant & Piggie and Houndsley and Catina, there is just something perfect about pairs in beginning readers. Bink & Gollie stand out from this all-star list for a few reasons, the main one being that they are humans and not animals! This lends a different tone to the stories and, ultimately gives the authors and illustrators a whole new playing field to explore. 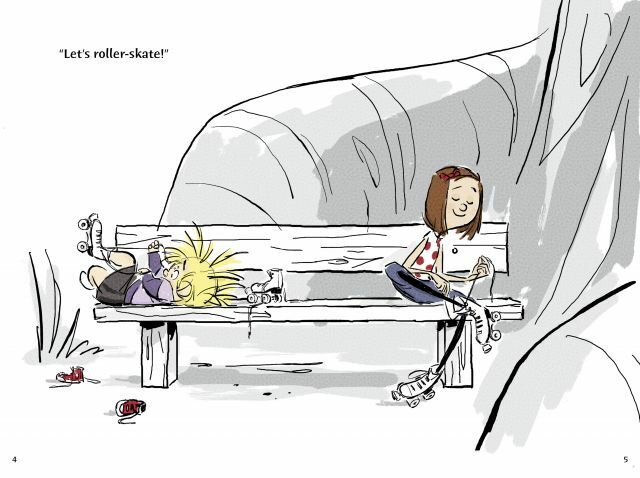 One of the things that I love most about these characters and their books is that Bink and Gollie seem to inhabit this magical space and place where they can be kids and do things that kids do in the absence of any adult authority figures. Basically, these girls have the enchanted lives and freedom that many kids had some sixty years ago and this makes for a very fun setting. Now, about these girls. And when I say "girls," don't automatically assume that boys will not want to read these books, as some of you (myself included) are wont to do. While it's just one kid, over and over my Star Wars, gun loving seven-year old son surprises me by his willingness to read stories with girls as the main characters, without being cajoled or even encouraged. After all, there are plenty of boys who read Junie B Jones and I think that Bink and Gollie have that gender neutral "hen" quality that I talk about in my article, Him, Hen, Her? Gender Equality in Children's Books. Bink is short, pudgy, impulsive utterly comfortable in her childishness. Bink gets excited by a giant bin of socks on sale, opting for the most colorful pair in the pile. She lives in the little cottage at the base of the tree. Gollie is tall, thin, reserved, particular and a bit like a teenager in her occasional disdain for Bink and her interests. Gollie likes to have occasional imaginary adventures, like the kind that finds her strapping on her crampons and climbing the snowy mountains of the Andes, Gollie lives at the top of the tree in an austere, modernist wonderland. The two sometimes meet at the bench on the branch in the middle. As Bird says, "The universe Bink and Gollie occupy could only exist in children’s literature. Not since the days of Winnie-the-Pooh have characters lived in such individual and striking homes." The speaking style of the two is as different as their appearances. Bink says things like, "It's a sock bonanza!" Gollie says things like, "Indeed it is. An extremely bright sock bonanza." Gollie also says things like, "Here I am, where none but a few have ventured. What an extraordinary accomplishment." 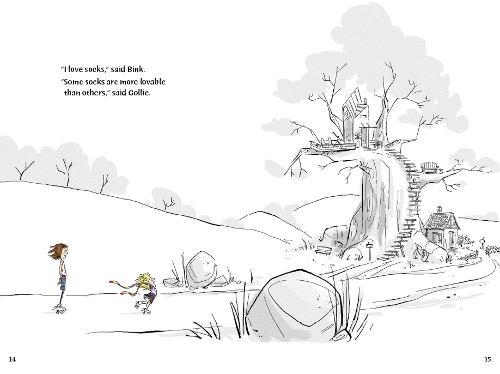 As a fellow bookseller who read the book commented, "Bink and Gollie sound like Spock and Captain Kirk, but as kids." With animal pairs, one is usually the neurotic and the other is the sound, balanced mind and calm presence. With Bink and Gollie, these roles flip and flop. Sometimes Bink seems impulsive, Gollie sane and stable. Other times, Gollie seems rigid and jealous while Bink seems generous and warm hearted. On top of it all, there are usually only 2 - 4 lines of text per page. However, I think most young readers will be completely engrossed by Fucile's illustrations which manage to seem richly detailed and sparse at the same time. One is left wondering to what extent Mr. Fucile came up with the book’s details and to what extent he created them out of his own brain. Was he told to give the Eccles’ Empire of Enchantment that particular air of treasure hunting mixed with a tinge of despair? Was he told that Bink was a creature of peanut butter and to add that element in when appropriate while Gollie belonged squarely on the pancake side of things? Was he instructed that rather than cell phones, Bink and Gollie use white cordless landlines? Was he asked to make Bink’s scarf at the end of the book the second bright sock purchased at thebeginningof the book? And on top of all that he includes little things you might not notice except on a fourth or fifth read. When Gollie decides to give Bink half her pancakes, notice that she gave Bink the much taller stack. 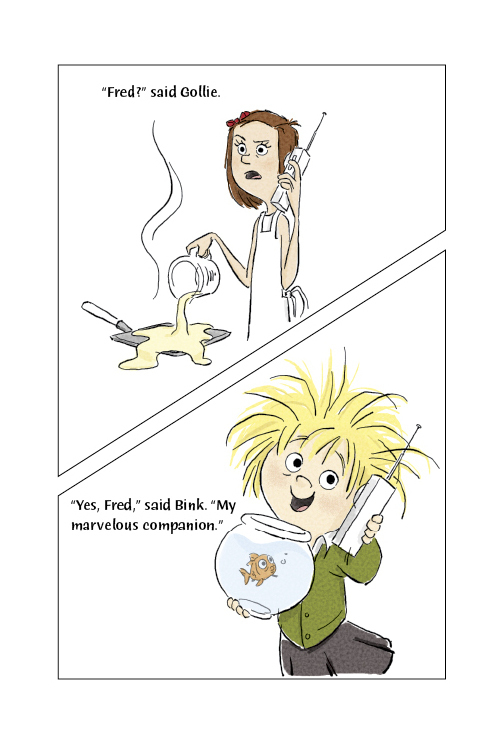 And when a besotted Bink agrees to hang out with Gollie, she is holding her phone out so that Fred the fish can hear the news as well. I 've often wondered this myself about the author/illustrator relationship and maybe, like sausage, it's better not to know exactly how these things are made. But, I do feel that an artist with Mr Fucile's background (he is an animator for PIXAR and has a long list of credits on his imdb page...) does contribute a significant amount to the development of the characters in books that he illustrates (Let's Do Nothing and Mitchell's License) and he makes these characters and the world that they live in very, very charming. But, let's talk about the stories! Don't You Need a New Pair of Socks, P.S. I'll Be Back Soon and Give a Fish a Home are the three stories that make up Bink & Gollie, which is an 81 page book. In the first story, a phone call from Bink to Gollie leads to a rollerskating adventure and a trip to Eccle's Empire of Enchantment for a new pair of stripy, rainbow socks for Bink. The socks cause Gollie to say, "the brightness of those socks pains me. I beg you not to purchase them." Bink is heedless. This creates some problems when the girls get home. Bink, exhausted from pulling her new socks on, goes up to Gollie's to see if she is making pancakes. Gollie is not making pancakes, but suggests to Bink, "Use your gray matter. You remove your outrageous socks, and I will make pancakes." Gollie's attitude makes me a bit uncomfortable - I wouldn't let my kids talk to each other that way, let alone be put out by a pair of socks, especially socks that bring such joy to their owner, but the fact of the matter is, this is how kids, in their own, wonderful unfiltered way, feel and talk to each other. But, to Bink's credit, she turns on her heel and is out the door saying, "The problem with Gollie is that it's either Gollie's way or the highway." While portrayed in a childish way by child characters, Gollie's attitude is one that adults experience in adult interactions on a daily basis, so ultimately I think there is tremendous value in the resolution of the story which has the two friends at odds meeting in the middle - literally. Bink takes off one sock and Gollie brings half of the pancakes she has made and the two commiserate on the bench that is half way between their houses. With Bink & Gollie : Two for One, we find the friends at the State Fair, just in time for summer! Whack a Duck, You're Special, Aren't You and Without Question make up the three stories in this new book. Having read this book first, it was such a treat to watch my son's face as he read the first story in which Bink tries to win the World's Largest Donut by knocking ducks over with a baseball. Bink's wind-up (which gets a two page spread) is hilarious and, as you may have guessed, she does not have good aim. Fucile's illustration of the carnival worker and his reaction after being beaned by Bink is priceless, had my son in stitches and was a fantastic flashback to the Looney Tunes of my youth. Bink throws all three balls and, while she doesn't win the World's Biggest Donut, she does buy three bags of mini-donuts that she and Gollie share with the duck man. You're Special, Aren't You finds Gollie entering the talent show and Bink finding a very sweet solution to her stage fright. In the final story, the girls visit Madame Prunely for a look into the crystal ball. As with Bink & Gollie, DiCamillo and McGhee bring their story back around to the sweet, wonderful friendship that exists between these two characters. I hope that this fantastic trio can create a few more books with these winning characters! I love DiCamillo and McGhee and this sounds like a great book but your right-we need a kid's opinion! My first grade daughter just brought this home from her school library and loves it, and has read it over and over. She loves the difference between the two friends, the wonderful illustrations, and the creative ways the friends solve their conflicts. Perfect! I think your daughter is the target audience for this book! I hope DiCamillo, McGhee and Fucile are at work on a second book!